Buy Your Guns Now Brothers!!! You are here: Home / News / Buy Your Guns Now Brothers!!! (ThyBlackMan.com) As a retired detective, former firearms instructor and former executive protective agent, I am not afraid of guns. But oddly enough I have noticed most African-Americans are. Guns are not dangerous. Guns are plastic and metal with no mind of their own. Firearms take on the character and behavior of their users – just like a car, a dollar or a motorcycle. Guns, therefore, can be safe, dangerous or deadly. They can be used to kill, to save others or to deter the bad guys. It’s all determined by the user and the circumstances. From gun shows to practice ranges, police officers to executive protection agents (did that too), home safety to hunting, competitive shooting to real standing your ground situations, a firearm can make a world of difference. Yet while Caucasian people in America are buying more and more guns, I have noticed more and more African-Americans seem to fear guns and pay little attention to the Second Amendment to the Constitution – the right to bear arms. Sadly and unfortunately those (other than law enforcement and former military) in the African-American community who tend to buy and use guns tend to be the criminals. And decent, honest African American citizens seem to end up as victims more so than anything else. Firearms, when used properly, are to protect valuable human lives. And who is more valuable than your wife, your children, your mother, father, grandparents and siblings? There is a reason the police carry firearms. There is a reason firearms are used in war, to protect the president, the governor, the mayor and so many others. Clearly your family is even more important to you. Protect and teach them. A stable-minded gun owner who is properly trained, competent and safe with his or her weapon, aware of the gun laws and consequences and willing to follow the gun laws is an asset to any community. In this article I am going to speak directly to African-Americans about what you should know when it comes to guns/firearms. My objective is to dispel the myth that guns are dangerous and to tell you much of what you need to know so you can be safer than ever before while exercising your 2nd Amendment Right. And what I am about to tell you could save your life or the lives of those you love. 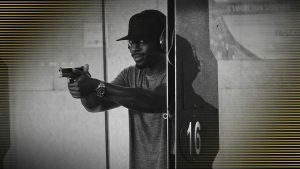 The Gun Control Deception: While more and more Republicans, Conservatives and yes “white” people are buying every gun they can get their hands on, honest “black” people are buying into the lies that guns are dangerous, guns should be turned in for a gift card or an Xbox and that you should not have a firearm. The truth needs unveiling and fast and your firearms are as safe as YOU make them. Buy your firearms legally (and new whenever possible). A convicted felon must not carry a firearm. But if you are a convicted felon, there are several other ways to protect yourself so don’t worry. And even individuals without felonies but on probation can be restricted as well. If you have been convicted of domestic violence, in some cases even where it was not a felony, you still should not carry a firearm. The law and the courts take these matters very, very seriously and you should too. Buy the right weapon for you. This includes the right caliber (.40, 9mm, .380 etc. ), the right size for your hand, the right feel, the number of rounds (bullets) you need the firearm to hold, what you need the firearm for, whether or not it will be carried or just stored for home protection and how much you would like to spend. Avoid buying the cheapest firearms. This is really a case where you get what you pay for. Plus decent firearms can be purchased for as little as $160. Stick with the name brands when purchasing a firearm and ammunition. Firearms made by companies such as Glock, Ruger, Taurus, Smith&Wesson, Remington, Sig Sauer and HK, to name a few. Do your research before you buy. There are of course more guidelines but these are the basics and this article was written to address personal safety more so than hunting, firearms competition or carrying a firearm as a part of your job. Get your weapons carry permit. There are commonly 2 different type permits – exposed (often called open carry) and concealed. Both require a federal background check and the permits are not costly. Some states take longer than others, some counties take longer than others and some background checks take longer than others, depending on what they have to check, how much checking they have to do and how many other people have to be checked around the same time. You can buy a weapon from a private owner or even in some gun shows without a background check or a weapons permit. At minimum you will need a valid state issued ID and to complete a bill of sale. I suggest you both meet at a notary and have the document notarized. You will need to see the seller’s ID as well because you should never, ever take the risk of buying a firearm that could be stolen and having no recourse. Remember if the law prohibits you from carrying, possessing or owning a firearm, DO NOT CIRCUMVENT THE SYSTEM. If you do and you are caught, you are only causing yourself more trouble than it is worth. Know the gun laws of your state and what states will honor your carry permit. This is called Reciprocity. Know what to do and what to say if you are approached by law enforcement while you are armed. This is very important. And while in many states you do not have to disclose that you have a firearm, I suggest that you disclose that up front. Then follow the officer’s instructions to the letter and do not reach for anything until you are instructed to. Remember the officer does not know you and what you consider a harmless move can be perceived differently by a police officer. Also remember you need to know where you can and cannot carry your weapon by law. Practice at the gun range regularly. But don’t just walk in and expect to start shooting. Know the rules of the gun range you visit. Get to know the staff, especially if you are a visitor or new gun owner. Observe first. Never ever walk in with your weapon exposed nor loaded. Remember there will be a lot of loaded guns and gun owners in a place where many of you do not know each other. That can be dangerous if you do not know the rules and safety procedures. How much should you practice? As much as you need to practice to be proficient, efficient and competent with your firearm. Learn all about your specific firearm. This includes how to clean it, what holster is best, what ammunition is best, how it fires and what to do if it jams. Try watching at least 10 YouTube videos about your firearm. Learn about gun safety. This includes how to secure or store your weapon at home and in your car, weapon retention, safe concealment etc. Make sure your weapon is readily accessible to authorized users in your home or car yet safe out of the hands of children, strangers, angry, intoxicated and unstable people. I recommend that you keep your firearms locked in a case made for doing just that – never just on a shelf or under the bed or in a shoebox or out in the open or in a drawer while loaded. Remember with semi-automatic weapons to make sure the chamber is empty too. Never share your weapon. That means never let another person borrow your weapon. Authorized family members sharing a weapon used for protection in the home might be one exception. But they also need to know how to use the weapon or they could cause more harm than good by mistake. Only draw your weapon when lives are at stake. That means never ever draw your weapon to scare someone. Never fire warning shots. Never draw your weapon unless you are prepared to fire. And if you have to fire, understand and be prepared for the possible consequences. Firearms are nothing to take lightly and once the round has left the chamber, you can never take it back. For a few dumb reasons (and hidden agendas), the Democratic party likes to blame guns for crimes as if the guns jumped up and shot someone all by themselves. They speak to the fear people have who have never owned or carried a firearm. Why not blame the criminals who used the guns instead? The argument is often made that there are too many guns on the streets. But I ask you which group of people in a building are more likely to get robbed? Those sitting there defenseless or those wearing exposed firearms? Why not exercise your right to protect your home from invasion and increase the safety for those you love? Remember the police cannot be everywhere when something happens and you may not have the time to wait. Be prepared. Criminals and people with criminal intent will always find ways to get their hands on firearms and hurt people – whether in a robbery, home invasion, car- jacking or active shooter massacre. Sad but true. So as a good person, why should you be unprepared? Buy your guns, exercise your right and hurry before they disappear from the gun store shelves. Just as the Jews were in Germany, we as an African-American people are heavily out-gunned and largely unprepared. A stable-minded gun owner who is properly trained, competent and safe with his or her weapon, aware of the gun laws and consequences and willing to follow the gun laws is an asset to the community. Many of our people may not want to own firearms but you better believe the criminals will.